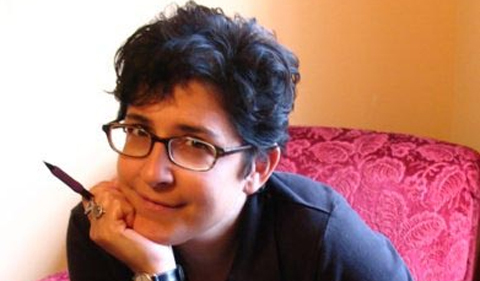 The 2017 Spring Literary Festival welcomes author Mary Cappello for a lecture in Walter Hall on Thursday, April 6, at 11 a.m., and a reading Friday, April 7, at 7:30 p.m. in Baker Theatre. In one of her excellent essays, Mary Cappello goes with a friend to experience a “gong bath,” where she’s told, along with a group of others in a yoga studio, “to lie flat on our backs…and try not to fidget. We’re to shut our eyes and merely listen while two soft-spoken men create sounds from an array of differently sized Tibetan gongs.” This “bath,” which Cappello tells us costs twenty dollars per head, becomes one of the book’s many strangely intriguing settings where, though she remains still and does not fidget, Cappello leaves her initial scene and ventures into various realms of science, medicine, imagination, love, and, most of all, a deep analysis of the self. “I am easily seduced,” Cappello confesses. “I’m a ready convert to any religion, keen to smuggle its riches into the waters of a deeper understanding: this art.” By “this art,” Cappello’s speaking primarily about the art of the essay on both the page and in everyday life: her “attempt”—to use one of those goals of the essay—to exist simultaneously in the action of inscription and the action of living. Thorough and perceptive, Cappello does seem, in all of her work, to focus on anything in the path of her eyes and then, ultimately, “smuggle its riches into the waters of deeper understanding.” This goal, easier said than done, is of course one of the timeless aims of literature. And as she smuggles, we benefit from that deeper understanding, too. Cappello, a Professor of English at the University of Rhode Island, has been the recipient of many awards including the Berlin Prize and the Guggenheim. Her five books, which push all boundaries of genre, include Night Bloom, Awkward: A Detour, Called Back, Swallow, and, most recently, Life Breaks In (A Mood Almanack). The narrative of cancer has become disconcertingly familiar to us. But Mary Cappello turns the story inside out, folds it up, and deftly re-opens it into something new and rather marvelous. . . With a bracing combination of intellectual and emotional acuity, Cappello explores the inanities and indignities of the medical establishment, the solitude and camaraderie of illness, the politics and poetics of cancer culture. In this book, Cappello does write about science, medicine, illness; but to compartmentalize her writing into tidy categories does a disservice to art that shatters categorization in both content and form. Cappello’s writing combines and juxtaposes and weaves seemingly any and all subject matter. What section of the bookstore, dear reader, carries work involving the human digestion of foreign bodies such as padlocks, half-dollars, and many safety pins? The Mary Cappello section. Cappello’s brilliant and fascinating book, Swallow: Foreign Bodies, Their Ingestion, Inspiration, and the Curious Doctor Who Extracted Them, delves not only into the history of human ingestion but also the life and obsessions of Dr. Chevalier Jackson, a laryngologist, who collected over 2,000 objects people had swallowed or inhaled. An admirer of Dickinson, Cappello not only tells it slant but, even more significant, she approaches her subject matter from an angle unlike most writers. In her essay, “For ‘Anyone Interested in Learning What Makes Us Human,’” which focuses on Cappello’s visit to Gunther von Hagens’ BODY WORLDS exhibit, Cappello takes us along on a tour of what critics call “the corpse art show.” This presentation of bodies, often skinned down “with the effect of exposing areas of the human body that we don’t usually see” becomes a meditation on the complicated relationship between both our voyeurism and squeamishness when it comes to the dead and death. One of Cappello’s talents is her ability to be both a part of that collective “horde” while also being able, in certain moments, to step away into reflection or analysis. David Foster Wallace once wrote that his goal as a journalist was to be one “giant floating eyeball.” With Cappello, we feel this vision, this attention to detail, the unblinking focus, her uncanny powers to lift nuance and irony from any scene: “It is a curious thing to consider how the dead and maimed bodies of American soldiers have been kept from our view while an exhibit of anonymous carcasses, shorn every which way, opened, sliced, and modeled for our viewing pleasure is available to us in our local science museums.” Where other writers only observe and record, though, Cappello pushes beyond into matters further complicating our understanding, formulating more questions which take us into deeper unknowns: “Is what makes us human that we want a view of ourselves that will always prove impossible?” With questions like this, she becomes more than that giant floating eyeball; she sees with urgency, looking out to see in, but recognizing that ultimate futility.